All liturgies will be celebrated in the church. A brief explanation of each of these liturgies follows the schedule. The liturgies of the Triduum (Holy Thursday, Good Friday, Easter Vigil) are connected intimately to one another. At one liturgy of the Triduum, we remember Jesus’ saving action. We remember his passion, death, and resurrection. If you have never participated in the liturgies during these three days, we hope that you will consider joining us. 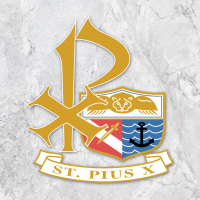 In fact, we need you here to make it a full expression of the prayer of our faith family of St. Pius X.
PALM SUNDAY OF THE LORD’S PASSION is the final Sunday of Lent. Its closeness to the end of Lent and the beginning of the Triduum gives this liturgy two very distinct and quite opposite features. We are reminded of Christ’s triumphal entry into Jerusalem through the first Gospel and the procession with palms. But once the blessing of palms concludes and we enter the church, the liturgy quickly reminds us of death, suffering, and Christ’s Passion. Notice some of the words and phrases in the opening collect: humility, submit, suffering…quite the contrast from the Hosanna! that we proclaim as the palms are blessed. The second reading, a hymn from Philippians explicitly shows us this contrast; Christ humbled himself. Because of this God greatly exalted him. Passion Sunday centers us upon Christ’s death in a very powerful way and in a different way from Good Friday. On Passion Sunday we celebrate the Passion of Christ’s death; whereas, on Good Friday we celebrate the glory of the cross and the power that comes from death. 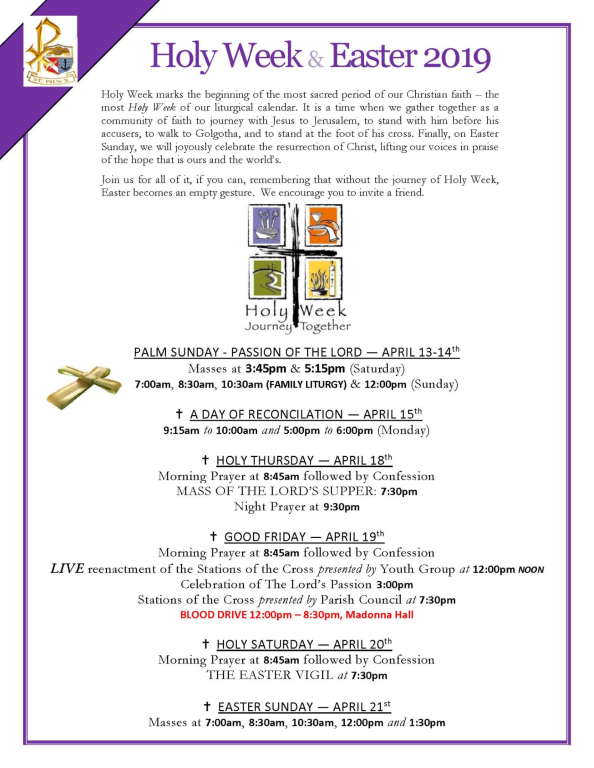 Also notice the authors of the Passion readings for Passion Sunday and Good Friday. On Passion Sunday, we always proclaim the Passion according to a synoptic—Matthew, Mark or Luke, but we never hear from John on Passion Sunday. The Passion of John is a very different telling of the Passion. John’s Passion centers more on the glory and kingship of Christ’s Passion. For this reason, John’s Passion is reserved exclusively for Good Friday. We mark Passion Sunday with contrast. We begin today with a festive opening, but the festivity greatly diminishes throughout the liturgy. We will depart today in silence, marking the beginning of this most solemn time of the church year. HOLY THURSDAY - We gather to celebrate the Mass of the Lord’s Supper. We recall Christ taking, breaking, and blessing the bread and giving us the command, “Do this in memory of me.” On this evening we proclaim the Gospel of John, where Jesus as humble servant, washes the feet of the disciples. He gives us his Mandatum (mandate) –“Love one another, as I have loved you.” So important was Jesus’ gesture of service, that our liturgy ritualizes the action. On Holy Thursday, everyone is invited to take part in washing each other’s feet. It is through this action that we truly place ourselves as humble servant to those around us. We then gather in remembrance as we celebrate the Eucharist. At the end of the liturgy, there is no blessing or fanfare. Instead, the entire congregation processes with song outside the church and into the lower level chapel. In this action, we process following the presence of Christ in the Eucharistic bread, symbolizing our journey with him to Gethsemane. The chapel remains open until midnight for people to pray and keep watch with our Lord. GOOD FRIDAY – On Good Friday we pick up where we left off on Holy Thursday with the Liturgy of the Passion at 7:30pm. This liturgy is not a Mass. The church is dark, and we begin in silence. The presider and ministers lay face down on the floor as the congregation kneels remembering Christ’s Passion on the cross. The Passion on Good Friday is proclaimed from the Gospel of John who portrays Jesus as humble king. John helps us to remember that through the glorious cross, we are given life. The general intercessions on Good Friday take a different form, a more profound and ancient form of intercessory prayer. We pray for specific intentions, both for the church and for the world, for unity, acceptance, and peace. We also have the opportunity to adore the cross on Friday. The cross is unveiled in the back of the church and processed up the aisle as we sing an acclamation remembering that it is through the cross that we are set free. We take time to individually touch or kiss the cross, adoring the glorious tree on which hung the savior of the world. EASTER VIGIL – The Easter Vigil is the culmination of everything we celebrated on Holy Thursday and Good Friday. As darkness falls, we gather at 7:30pm outside the church, where a fire is burning. We light our new paschal candle from this fire and process into the church. The light spreads to the entire church as we light our candles, symbolizing the light of Christ carried throughout the world. In the candlelight we proclaim the glory of God’s saving works in the Exsultet. A series of Scripture readings follow where we recall God’s action throughout history. Then with fanfare and glorious music we proclaim the resurrection of our Lord. Following the homily, adults are baptized and received into the Catholic Church. The new life of Christ is visible in our midst through their Baptism. The liturgy then culminates with the Eucharistic feast. The Eucharist is our thanksgiving for the renewal of life in our community and in ourselves, for with Christ we have passed through sin and death to new life in the Paschal Mystery.